Latest Star Wars Resistance Trailer Showcases a Ton of Familiar Faces | Nerd Much? With the series launching in under two weeks, Disney has released a new Star Wars Resistance trailer for our enjoyment. And the latest footage from the series is chock-full of familiar and big name faces. Today’s Star Wars Resistance trailer primarily follows the series’ main character, Kaz. But there’s a solid amount of the show’s Fireball Crew and the ace pilots too. Training to become an ace pilot, Kaz is taken under the wing of Poe Dameron (voiced by Oscar Isaac) whom we’ve seen in some of this footage before. Kaz is sent on an undercover mission as a spy by Poe. He’s tasked with finding out “who’s loyal to the good guys and who isn’t.” This is in addition to Kaz’s races in his attempts to become a member of the ace pilots. An accolade that we quickly see can be quite dangerous in itself. Footage later turns to an ominous look at The First Order’s Starkiller Base. 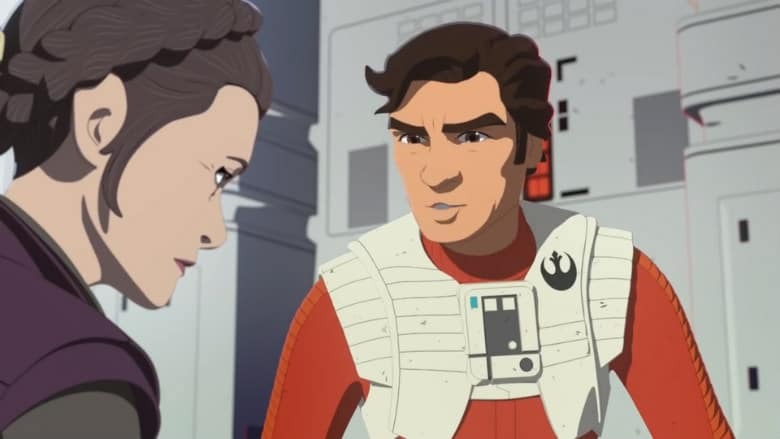 We’re then treated to a quick exchange between Poe Dameron and General Leia Organa, in which Rachel Butera has now been cast in the iconic role. Poe states that “The First Order is clearly making weapons.” To which Leia responds “we’re going to need all the help we can get.” Thus, the likely excuse that Kaz gets promoted to the position that he’s long desired. We then get to see a bit of dogfighting between Kaz, his team, and The First Order. There’s a gold suited Stormtrooper that we get a glimpse of, and also Captain Phasma in her immediately recognizable chrome Stormtrooper garb. Phasma too is voice by live-action counterpart, Gwendoline Christie. Adam Driver is said to be in the series too as Kylo Ren, but we’ve yet to see glimpses of him in either Star Wars Resistance trailer. Hyped by the latest Star Wars Resistance trailer? Well, you don’t have long to wait for the real deal. The series debuts on Disney Channel and DisneyNOW with a one-hour premiere on October 7th at 10:00 p.m. Two additional new episodes will debut immediately then too via the DisneyNOW app or the Disney Channel via Video on Demand.